For Valentine’s Day, how about a special homemade project for your sweetie? IMPORTANT FIRST STEP: Create a new Word document and go to Page Setup to change the paper size to 8″ x 10″. This way, it will fit in a regular 8″ x 10″ frame. Next, I found the lyrics to the song my husband and I call “our song” – the one we to which we danced our first dance at our wedding. (“Back at One” by Brian McKnight is ours.) I copied and pasted the lyrics into the 8″ x 10″ Word document and took out all the line breaks. Instead of line breaks, I added 3 spaces between the words where line breaks would have occurred. 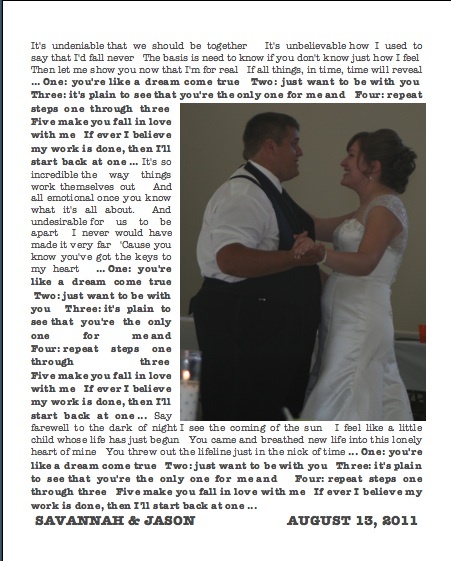 I also used the “Insert -> Picture -> From File” function to insert a photo of us in our first dance at our wedding. I justified the text and put it in a font I like. I bolded the chorus every time it occurred. I also checked the lyrics to make sure they were what I remembered … sometimes those sites get it wrong! Then at the bottom I added our names and the date of our wedding. Printed it out on card stock (trimmed to 8″ x 10″) and it is ready for a frame! Happy Valentine’s Day! If you have a significant other, would you make something for him or her as a gift? This entry was posted in DIY, How-To and tagged anniversary, dance, DIY, first dance, gift, lyrics, photo, photograph, present, Valentine, valentine's day, wedding. Bookmark the permalink.